It's a beautiful day for me today. Second posts today.. Sayyyyy whaaattt? I have an holo polish that I figured deserved it's own post for you guys. I have swatched the entire Zoya's Winter 2013 collection - called the ZENITH COLLECTION on the blog already, but I had to make this post with a simple polka dot nail art I did using Dream from the zenith collection. White dots was done with Zoya - Purity. Zoya - Dream is such a beauty to behold! I love the holographic goodness that it is, and the shade of blue is JUST perfect! How amazing right? Do you own Zoya Dream Yet? If not, What are you waiting for? Especially with the amazing holiday deals Zoya has! This brings me to the deal alert part of this post! This Holiday Season, Zoya has some irresistible deals for us all! 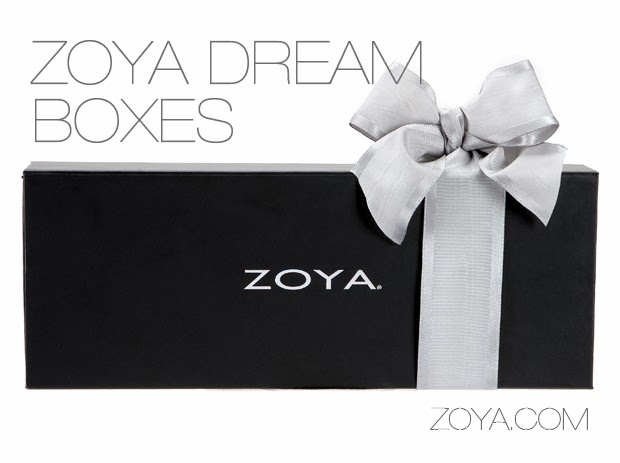 ZOYA DREAM BOXES Just add a bow and you are ready to go! CLICK HERE to read more about more Zoya deals you DON'T Want to miss! Share your thoughts with me. I did white dots over Dream too and it is outstanding! Looks great on you! I love this! Polka dots are so cute! Nail Art with a Bunchaaa Zoya Nail Polishes! ..... But Why You So Bright....?